Arms: Or, a pall engrailed moline azure. Crest: A heraldic dolphin urinant azure crowned with a rayonny crown Or. 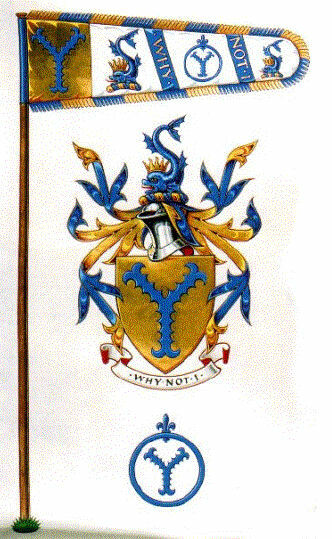 The arms and crest are a pun on Mr Symons's name. Few people manage to spell 'Symons' correctly, so the pall is a reminder that there is a Y in the name and not an I. The crest is a differenced dolphin in the shape of an S.